A friend and I popped into the National Gallery one lunchtime this week. Among the tourists and school kids, we were guided by gently spoken attendants, who steered us towards Dutch Masters – and then on to Medieval gilt and godliness. 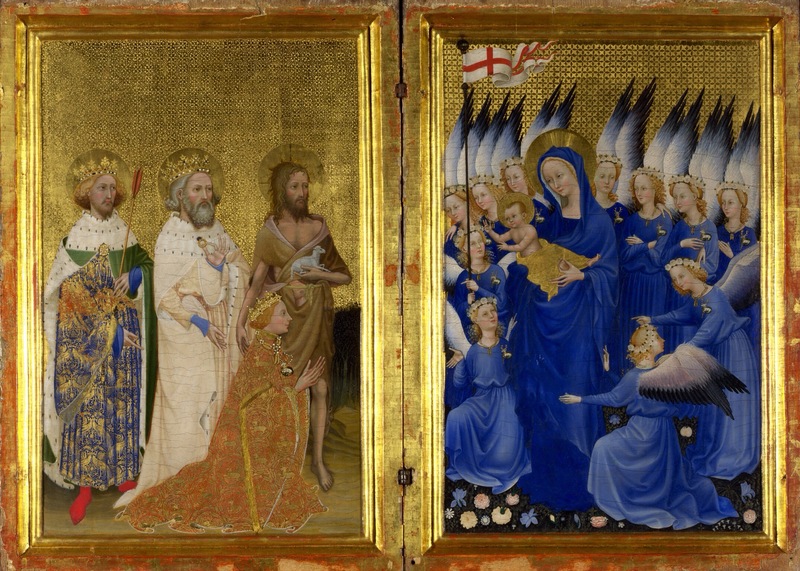 I was keen to find the Wilton Diptych (above). The photo above hardly does it justice. By an unknown artist (as everything was before Giotto) it dates from the 1390s. And a fine piece of early English patriotism it is too. A gift to him, it shows King Richard II being presented to the Virgin and child by John the Baptist. An English King was clearly worthy of the Devine in every respect. What really amazes – in a object over 700 years old – are the colours. The blue is dazzling, set off by the expanses of gold. And the intricate gilt of the robes is staggeringly precise. How did the unknown artist procure, prepare and render these vibrant hues in the very midst of the Dark Ages? But forget a few hundreds of years. I read this week that there is new evidence from China of the widespread use of coal for smelting fully 4,500 years ago. They guess coal was discovered and deployed because large scale deforestation had forced innovation – all the charcoal had run out. What remains is so little, that we risk underestimating the sophistication of long past eras. We will never know their names, but our ancient forebears were finding and combining precious metals and minerals with amazing, ingenuity, craft and artistry long centuries ago. This dazzling blue and gold panel, made for an English King, is an incredibly rare and precious proof of genuine ancient alchemy. Devine.